Regulation (EU) No 1143/2014 of the European Parliament and of the Council of 22 October 2014 on the prevention and management of the introduction and spread of invasive alien species, whose objective is to prevent, reduce and mitigate the adverse effects on biodiversity caused by the introduction and spread within the European Union of invasive alien species. Commission Implementing Regulation (EU) 2016/1141 of 13 July 2016 adopting a list of invasive alien species of Union concern pursuant to Regulation (EU) No 1143/2014 of the European Parliament and of the Council. Publication of the European Commission on the inclusion of invasive alien species in LIFE program. It draws on lessons learned from LIFE projects on IAS management. French order of 10 August 2004 concerning the conditions for authorizing the detention of animals of certain non-domestic species in breeding, selling, renting, transit or public display establishments of non-domestic animals. French order of 10 August 2004 concerning the general rules for the functioning of approved facilities for the breeding of animals of non-domestic species. The first monitoring committee took place on 13 October 2016. The expectations of the European Commission, from a technical point of view, but also from an administrative and financial point of view, were discussed. The second monitoring committee took place on 11 April 2017. The launching of the field actions and the difficulties encountered were discussed. Each LIFE project is monitored by a NEEMO team monitor. Frédéric Brochier is responsible for the monitoring of LIFE CROAA. Meetings are organized at least once a year. The first took place on 11 and 12 April 2017 in Blois. The technical aspects of the project were discussed on 11 April. This report concerns the administrative and financial visit of Frédéric Brochier, NEEMO monitor of LIFE CROAA, which took place on 12 April 2017. The LIFE CROAA project have to report to the European Commission on its progress, through three progress reports, a mid-term report and a final report. The first progress report was forwarded to the EC at the beginning of July 2017. The first progress report was sent to the EC at the beginning of July 2017. The download document contains the annexes to the first progress report. Rapport publié en 2005 sur l'étude réalisée par Grosselet et al entre 2003 et 2005 sur la population introduite de Xénope lisse dans les Deux-Sèvres. La répartition et les impacts du Xénope lisse sur les peuplements autochtones y sont traités. Rapport publié en 2009 sur l'étude réalisée par Thirion et al entre 2008 et 2009 sur un programme de préfiguration de lutte contre le Xénope lisse en Frabce. Un bilan des connaissances sur l'espèce et les résultats des expérimentatiions de lutte chimique sont présentés. Article publié en 2006 dans Le Courrier de la Nature sur l'introduction, la progression et les impacts du Xénope lisse, introduit dans les Deux-Sèvres. Article published in December 2016 in "Recherches naturalistes - La revue des passionnés de nature en région Centre-Val de Loire"
Amphibiens envahissants : comment s'en débarasser ? Un projet européen pour préserver la biodiversité : le "LIFE CROAA"
Diet of feral Xenopus laevis (Daudin) in South Wales, U.K. Article published in Alytes in 2006 presenting the first results of a telemetric monitoring of seven individuals of African clawed frog whose objective is to study the processes of expansion of the populations introduced in western France. Article published in Biological invasions in 2012 whose objective is to make an assessment of all the introductions of African clawed frog in the world, in order to identify preferential dispersal pathways, the time between introduction and discovery and whether the oldest populations show signs of decline. Ongoing invasions of the African clawed frog, Xenopus laevis: a global review. Supplementary material. Are invasive populations characterized by a broader diet than native populations? La Grenouille taureau Rana catesbeiana dans le sud-ouest de la France. Premiers résultats du programme de lutte. Article published in 2007 in the Bulletin de la Société Herpétologique de France, presenting the results of a radio-telemetric monitoring of the Bullfrog, implemented by the association Cistude Nature in Gironde between September 2004 and June 2005. 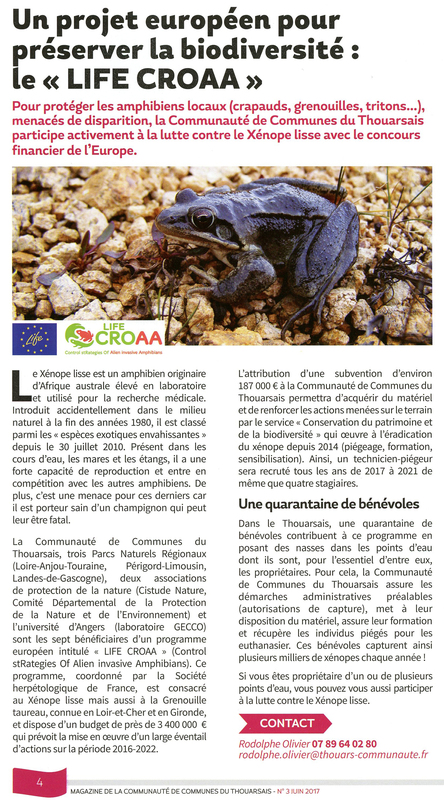 Article published in 2008 in the Bulletin de la Société Herpétologique de France, presenting the results of the study program (2003-2007), implemented by the association Cistude Nature, for the implementation of a plan for the eradication of Bullfrog in Aquitaine. A new record for the American Bullfrog, Lithobates catesbeianus (Shaw,1802) (Amphibia Anura Ranidae), near Rome (Latium, Italy).